There has been a lot of speculation on the potential “super fight” between current UFC middleweight champion Anderson Silva and current UFC welterweight champion Georges St-Pierre. This might be the case, but the big question for me is, who is the current number one contender in the welterweight division? Tristar head trainer Firas Zahabi (GSP’s trainer) thinks that Nick Diaz is still the number one contender upon his return. Johny Hendricks is also deserving of a title shot, he said, but lacks the resume to be the next challenger. Die hard fans still want to see the Diaz/GSP fight. I’m sure GSP hasn’t forgotten being called out by the brash 29 year old from Stockton after a dominate decision win over B.J. Penn at UFC 137. Diaz’s resume speaks for itself and he should be considered the number one contender even though he is coming off a loss. If the GSP/Silva “super fight” takes place, Diaz vs. Hendricks for the true number one contender spot would make perfect sense, especially if you put both fights on the same card. Diaz has been rumored to return against Josh Koscheck, but will a win over Koscheck really do anything for a guy like Diaz who has such a respected resume? 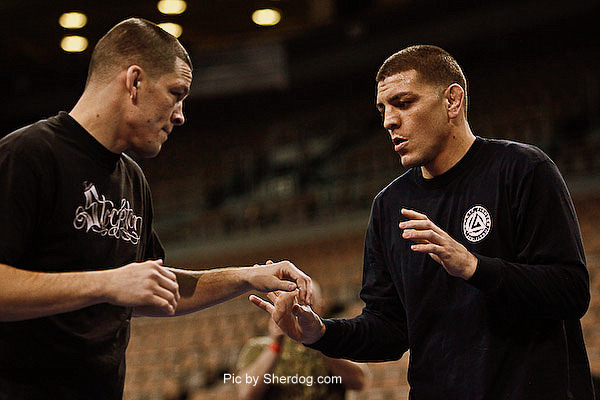 The future is bleak for Diaz at the moment as GSP is on an undeserved vacation after not fighting for over a year. Whatever St-Pierre’s decision, Zahabi said the champ has options at welterweight. Who do you want to see GSP fight next? Hendricks, Diaz, Silva or other? Watch the video below of Nick Diaz as he does his thing in the cage.